Long as it has been amongst the symbols of governmental power in the United Kingdom, “Number 10” as it is known, is also one of the most iconic residences for a world leader. The history of the building itself is just as fascinating as those Prime Ministers who resided within and the historical actions of their governments. Everything from its origins to its design and important moments are part of the fascinating story of this great London building. What is now one large house began as three. The first house on the site was leased from Queen Elizabeth I to Sir Thomas Knyvet in 1581, a man who later gained fame as one of the men who stopped the Gundpowder Plot in 1605. When he and his wife died without issue, the house passed to their niece, and later to George Downing. Samuel Pepys’s diary mentioned that Downing was a “perfidious rogue”, so it should be little surprise that when Downing acquired the land, he wanted to throw up some cheaply built townhomes on the street that would come to bear his name. For this task, he hired famed architect Sir Christopher Wren, who built a series of 15 to 20 houses on a cul-de-sac from 1682 to 1684. Downing wanted to maximise his profits, so the homes were built cheap with shaky foundations for the boggy ground. Winston Churchill once said that Number 10 was “Shaky and lightly built by the profiteering contractor whose name they bear.” What’s more, the numbering was disorganised, and what we know as No. 10 started as No. 5. Adding to the homes’ problems, the Countess of Lichfield, daughter to King Charles II, wasn’t too happy that Downing’s townhomes were so close to her own house that people could see into her windows. The Countess’s home, also known as “The House at the Back” was a large mansion that went out of her possession when she and her husband followed King James II into exile after the Glorious Revolution. The “House at the Back” reverted to the Crown, which leased it out to loyal members of court. After it reverted to King George II, he decided to offer it to Sir Robert Walpole, the Prime Minister, for his service to the country. The lease included not only the house, but also one of Downing’s townhomes. Walpole accepted the King’s gift on the condition that the properties would be in the possession of the Office of the First Lord of the Treasury. He then persuaded a man named Mr. Chicken, who was living in an adjoining cottage, to move to another residence and set about combining all three into one building. Construction was managed by William Kent, who not only connected the buildings together, but completely gutted and remodeled the inside. He also closed off the north entrance and made the No. 10 door the main entrance to make it easier for Walpole to travel to Parliament. Becoming the home of Prime Ministers, the longest anyone has ever lived there was twenty years, during William Pitt the Younger’s time as First Lord. After he died, the building saw continued use as the Prime Minister’s office, but succeeding PMs opted to live in their own homes for the next 70 years. When Benjamin Disraeli became Prime Minister, he described the house’s condition as “dingy and decaying” and decided that more renovations were in order. He persuaded Parliament to pay for modernising the office space, but paid for the private residence improvements himself. Electric lighting was installed in 1884 under William Gladstone. In 1910, Arthur William Balfour became Prime Minister and was the first person to bring a car to Number 10. What’s more, he’d been living there even before he was Prime Minister as his uncle and predecessor, Lord Salisbury, opted not to use the residence and let Balfour have it. Balfour would revive the tradition of making Number 10 the official residence. Over the course of the 20th Century, further improvements strengthened the building out of necessity. During the Blitz of World War II, bombs fell near Downing Street, damaging the kitchen and state rooms. The foundations were rebuilt and were steel-reinforced in the late 1950s and further renovations made Number 10 40% original materials and 60% new. Margaret Thatcher would also make her own improvements to the interior rooms during her premiership. In 1991, the original oak door was replaced with a bomb-proof metal one after an IRA mortar launched from a white van damaged the building’s facade. Today, the current inhabitant is David Cameron, who actually prefers to live in No. 11. Yet, No. 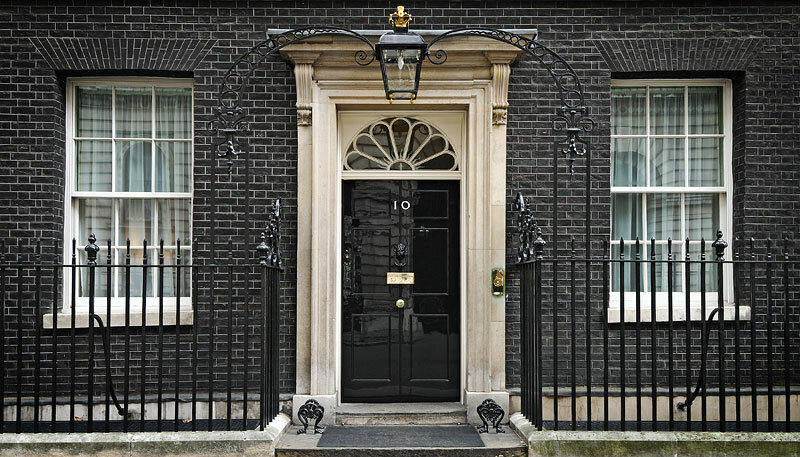 10 Downing Street will always be associated with the highest position in Her Majesty’s government. Nearly every man and woman who has lived there left a definitive mark on Britain and it will always be an important place in the country’s history and to London. I thought that number 11 was for the occupancy of the Chancellor of the Exchequer? The accommodation in No 11 is larger. If the PM has a family, and the Chancellor doesn’t, they usually swop over. Sir George Downing lived his early life in Salem Mass. as was a member of the first (1642) graduating class of Harvard.